Skiers jumped and were thrown off of a ski lift that had malfunctioned and started moving quickly in reverse. 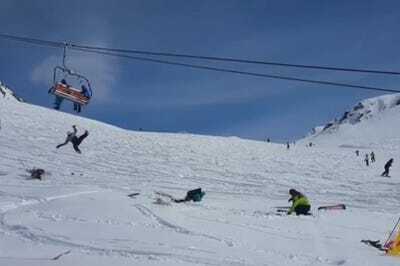 Disturbing video captured the moment as others screamed for the skiers to jump off the lift before it reached the bottom. The company that owns the resort where the ski lift is located is looking into the incident. Videos distributed on social media captured dramatic footage of skiers being thrown off of a ski lift in the country of Georgia, as reported by CNN. The ski lift suddenly started moving in reverse at high speed. At least ten people were injured, according to CNN’s report. Eyewitness also posted photos and footage of the aftermath of the ski lift’s malfunction, and the wreckage that it produced. The ski lift in question was part of a resort owned by Mountain Resorts Development Company, which says that it has reached out to the ski lift manufacturer about determining the cause of the incident. Injured were taken to the resort’s clinic, according to the company.